The block diagram of a single channel DAS is shown in Figure. It consists of a signal conditioner, analog to digital converter. The output of the signal conditioner is given to to the A/D converter. This circuit performs repetitive conversions at a free running rate. The rate of conversion is internally determined. The digital outputs from the buffer are fed to a storage system or a printer or to a computer for further analysis. It is slow and if the output is to be professed by digital equipment the BCD has to be changed into binary coding. While it is free running the data from the A/D converter is transferred to the interface register. This is done at a rate determined by the DPM itself, than the commands beginning from the external interface. Mostly low resolution [8/10 bit] A/D converters are manufactured with a single ended input. They have a normalized analog input range of the order of 5 -10 V, bipolar or unipolar. Amplifiers are used for signal levels which are low compared to the input requirement. 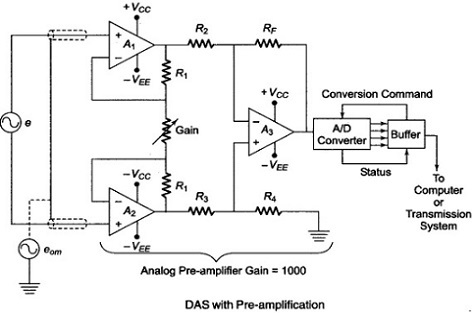 Amplifiers can be used to improve the level of the input signal to match the converter input. This provides optimum accuracy and resolution. An arrangement for preamplification is shown in Figure. Differential amplifiers are necessary when the input signal levels are below one tenth of a mV, or when resolution of 14 bits or 16 bits. Instrumentation amplifiers are used when differential output is to be handled from a bridge network. The circuit shown in Figure, consists of three amplifier instrumentation amplifier. The output of the amplifier is given to the conditioning circuit. The accuracy, linearity and gain stability specifications must be carefully considered to see that the system has no limitations. If the input signals are to be isolated physically from the system the conductive paths are to be broken. This is done using transformer coupling or using optocoupled isolation amplifier. Such isolation is useful in handling signals from high voltage sources and transmission towers, Isolation is essential in biomedical applications. In order to eliminate noise and high frequency components the output of the preamplifiers can be fed to filters. Filters effectively compensate for transmission sensitivity loss at high frequency. Thus the dynamic range of measurement will be enhanced. To preserve the phase dependent data special filters like tracking filters are used.